God had the First Word in the universe when He spoke it into existence. He will also have the Last Word in EVERYTHING! If you are in a tough situation (as a follower of Christ), the situation will be finalized when God speaks the Last Word in that situation and resolves it! “Look, I am coming soon! My reward is with Me, and I will give to each person according to what they have done. See you at the altar of prayer where we will hang-out until God speaks the Last Word in our trial. Pain — especially chronic pain — can drive a person to seek temporary or even permanent relief that is just flat wrong. The pain counsels us to try this or that, even when this or that is completely illogical and morally wrong. Pain tries to be both our torturer and our counselor as well. But pain’s counsel is not in our best interest nor in the best interest of bringing glory to God. The counsel of chronic pain can lead a person to suicide, even though that really does not solve anything. The afterlife for suiciders is not pain-free. The counsel of chronic pain can lead a person to do things or try things that they never would have imagined they would ever do. Nonetheless, they are counseled, they are tempted, and some sadly cave-in to the counsel. As a person who lives in bed and in chronic pain I can testify to the “counsels” of the pain, the “advice” that might set me free from the pain, either temporarily or permanently. If you too are in a minute-by-minute battle with chronic pain (physical and emotional), you too have heard the “counsel” of the pain. Let’s agree to wholeheartedly reject the counsel of chronic pain, and hold firmly to the counsel of the scriptures and the Holy Spirit. Yes, we are in a war… a war of life and death! Let’s choose life and those things that will result in our lives bringing glory to God. 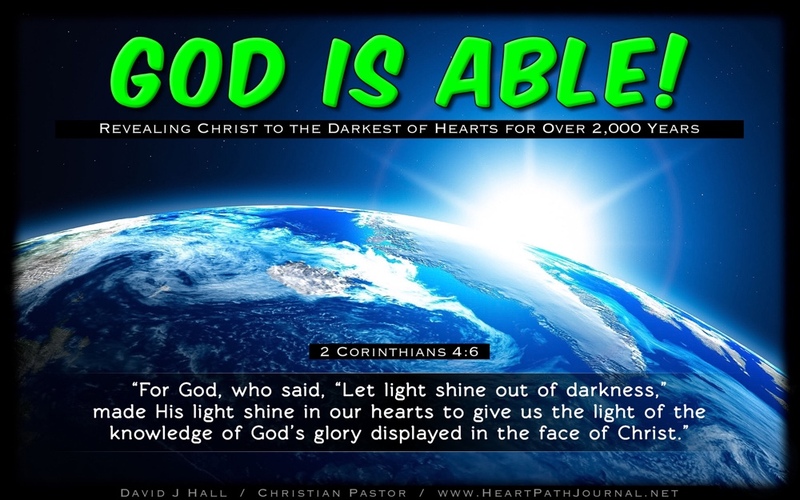 Our perseverance is a tremendous testimony! See you at the altar of prayer, my fellow pain warriors! Not only can we survive, we can thrive in our spirit even as we persevere! This website is the portal for 3 of my online journals written from a pastor’s perspective for today’s Christian. How do each of us react when we don’t get what we want, when we want, and how we want it? The “Emotional Bombers” concept I think originated in a conversation my wife and I had some years ago. We were having to be around someone who had a hair-trigger temper, and we noticed that we had been coerced into giving them what they wanted, when they wanted it, and how they wanted it. 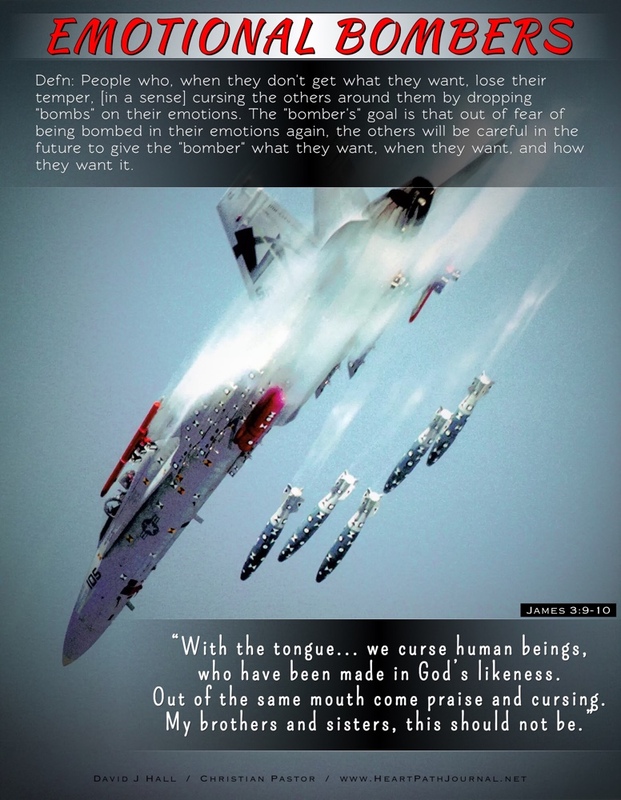 Upon recognizing this cruel dynamic we were able to get back on solid ground in how we approached the “bomber.” Needless to say, they were NOT happy about that, so they did the only thing that their character was in a habit of doing: they went on a bombing run over our emotion realm. “A soft answer turns away wrath” (Proverbs 15:1) has a couple of applications in this kind of scenario. (1) The other person may quiet down to our level of calm, or (2) at the very least, it will provide a means of rendering those emotional bombs inert — unable to explode in our own lives. It’s easy to identify people who are “Emotional Bombers,” but what about the person that we see in the mirror everyday? We all appreciate recognition for the good things that we do. We may feel embarrassed at the moment of the accolades, but deep down inside we are affirmed in our service of others. As we live our lives in service to the King, much of what we do will remain unknown to others, and most certainly we will not receive recognition for those things. However, we have a King whom we serve that makes a special note of each of our services rendered to Him and to other people, and the heart with which we offer those services. 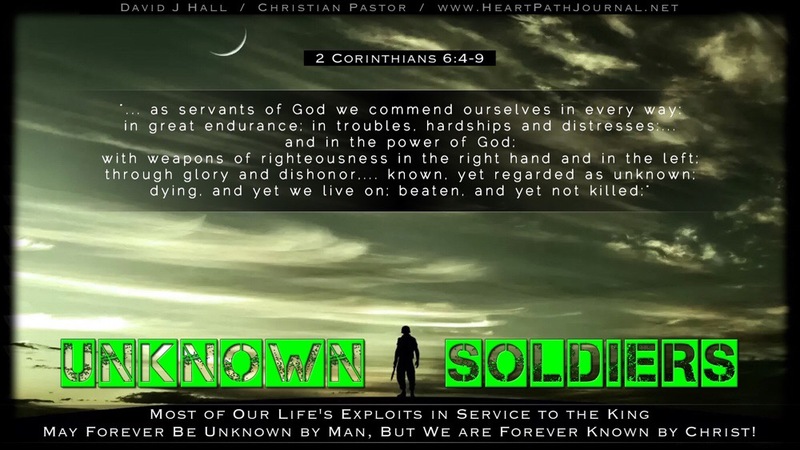 Let’s not be dismayed when we realize that we are serving as an Unknown Soldier among people. Christ is building His church through our faithful, soldier-like service. 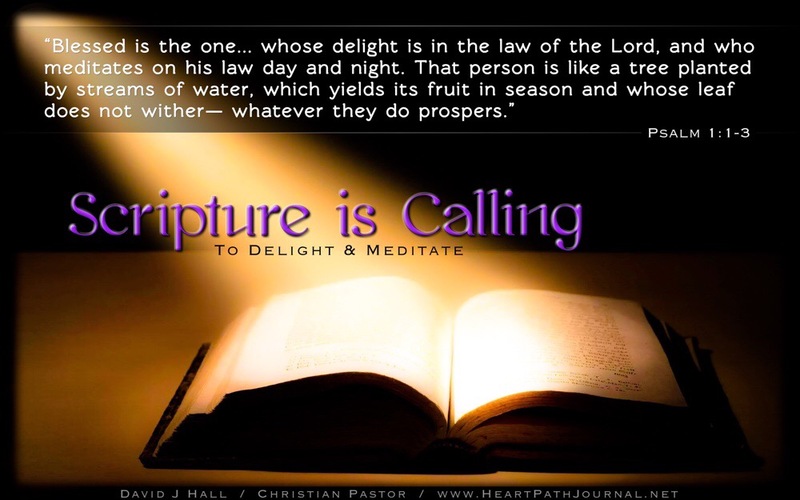 Do you have a loved one or a friend for whom you have been praying, for God’s revelation of Christ in their heart, and for their subsequent surrender to His Lordship, receiving the joy of His salvation? Has it been a long road for both you and them? Don’t be discouraged, my friend, and never give-up! Christ suffered crucifixion and death on behalf of their sins, just as He did for ours, and He has certainly NOT forgotten them. And today, as the living Christ, He passionately desires to receive them into His kingdom. Keep praying for your loved ones and friends. Our sincere, faith-filled, passionate prayers play a strategic role in their salvation, a role that we do not fully understand. A good soldier does not need to fully understand every single dynamic of the battlefield, they just need to know what their orders are and how to use the weapons at their disposal to achieve their mission. “Semper Fi,” my fellow soldiers! There are times in the course of life when situations arise where evil, in one of its many forms, threatens the God-given life of those around us. In times like these (as in the story of Esther), God has already prepared for someone to step forward that ends up changing the course of history. However, that one person who will step forward likely doesn’t know that they are God’s secret weapon for that specific battle. All they know is, in that moment, something explodes within their heart and soul: they must step forward. 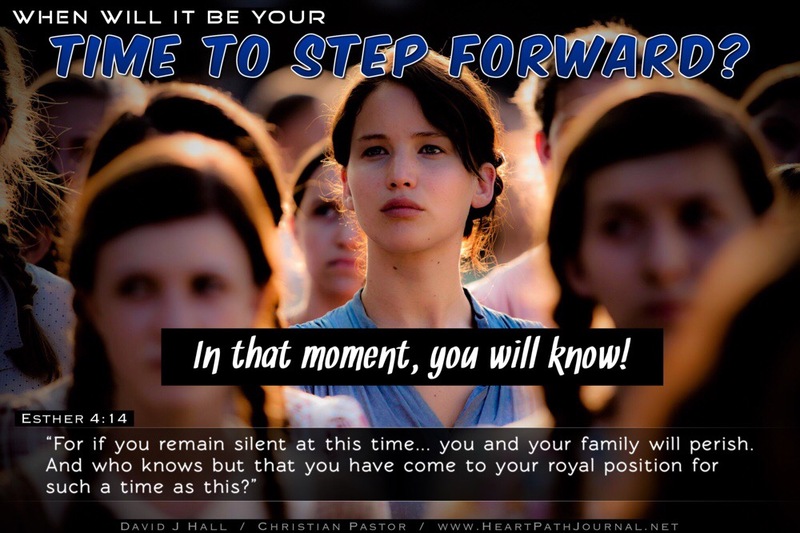 Perhaps you are wondering when it will be your time to step forward. Don’t worry. In that moment, you will know! 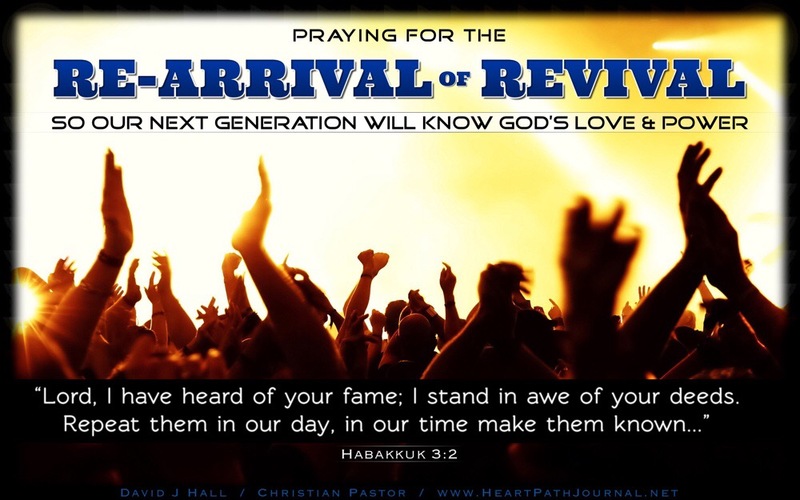 For those of us who have first-hand experience of the Love & Power of God that is poured out during a revival, we owe it to our next generation to seek the Lord on their behalf in long term prayer and intercession for the re-arrival of His revival. We already know it is God’s will that each generation know Him. All that is needed now is for us to (so to speak) pray His kingdom down from Heaven and into the hearts of our youth. Let’s passionately intercede like their eternity rests upon our prayers… because it does! 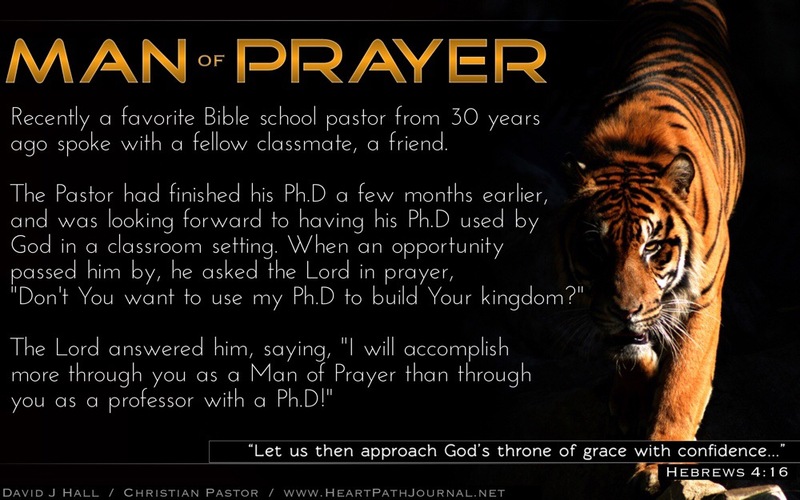 In Honor of those Men & Women of Prayer who allow God to conquer nations through their faith, while on their knees in prayer.